Hi, friends! Have you had Spring Break, yet? Did you get to do something fun? We just returned from Spring Break in Arizona….OK, a week ago. I am still adjusting to being back to reality. I have been dragging my feet a little bit as far as unpacking goes. Anyone else? I did manage to finally successfully unpack and do all of the laundry. I call that winning! It was the little lady’s birthday on Monday (although she is now taller than me) so I had to get it together to celebrate her…laundry can wait! The weather was perfect…when we landed in Phoenix. As we arrived to our airport to leave home it was raining…awesome. I just spent the day getting the family ready for the trip AND doing my hair. I love Midwest humidity (said no woman with uncooperative hair ever). By the time we boarded the plane it was snowing. We sat on the tarmac for 2 hours waiting for them to de-ice the plane and our flight finally left at 10pm. Then it was a 4 hour flight. Needless to say, we were all exhausted when we arrived. But the weather was beautiful! But, then I woke up to this and I wasn’t mad. Our older children joined us on this trip. They needed a break from work and we couldn’t be more thrilled that they decided to spend their break with us so we could all be together as a family! I feel so blessed that they still want to spend time with us…and bring their husband’s and significant others. Maybe that means we aren’t that boring or embarrassing, lol! I lived in Arizona for a few years. It is where I met my husband and got married. It is also where our first baby was born. We are very familiar with the Phoenix area and love it! While we didn’t do a lot of tourist activities, we did discover some fun things that we had never done before and will definitely be doing again the next time we go there. We had a lot of things we wanted to do, but hanging by the pool was winning time and time again! Sunday we spent at the pool. The three-hour time difference was getting to me a little so I was tired. Does that make me a wimp, lol? A boy who the girls used to hang out with daily as kids, and whose family we used to vacation with, just moved to Phoenix so he came and met us at the pool and hung out with our family for the whole day. It was so fun to see him all grown up! Monday we hit Scottsdale for some shopping and to have lunch with friends at True Food Kitchen. I have a new favorite. We don’t have that where I live but it is my new favorite place to eat. If you have never been there you need to go. Now. The food was amazing! Then we went for coffee. My son-in-law is obsessed with finding amazing coffee shops that are not Starbucks so we checked out this cute little shop called Press. It was good, but I still love my Starbucks. (Shhhh, don’t tell him I said that). Tuesday was the best day! We rented a 24′ pontoon boat at Scorpion Bay for the whole family to cruise Lake Pleasant in North Peoria. Before we headed out, we ate lunch at the Scorpion Bay Grill. It is one of those cool little restaurants at the end of a pier, with large garage door walls that completely open allowing the perfect breeze to blow through. We got a table outside on the patio to enjoy the sunshine and beautiful weather. The food was good and the company was even better! The beauty of the high desert was all around us. The desert is its own kind of beautiful. I appreciate what it offers in contrast to where we live now. The lake was so much bigger than we expected and had all of these little fingers to motor in to. We saw things we have never seen before. I had no idea that wild burrows were a thing (and I lived in Phoenix for 9 years) and I also never knew all snakes could swim. We saw a HUGE rattle snake just floating along IN THE MIDDLE OF THE LAKE! I was so horrified…never getting in the water again! But, that didn’t stop the others from getting in. Along with renting the boat for 1/2 a day, we rented a tube to pull behind. Surprisingly enough, the boat’s motor was fast enough to pull it and provide us some good laughs for the afternoon. My son got to play captain and thought it was pretty cool! He tortured these guys with the wake! Wednesday was another pool day. We worked a little which is nice because we all work remotely from our computers so really we can work anywhere. All of us. But the weather was perfect and the pool was empty so we had the place to ourselves. Frisbee became a new (but old) favorite game. We had dinner and sat by the fire pit with wine and had a great debate over whether this cactus was an aloe vera plant or not. I said NO. They all insisted it was. Who do you think was right? Our older children left on Thursday and that was sad. I did a college tour with our son in the morning and then we all saw the new movie “Shazam”. Cute movie. Friday was another pool day. We just loved the weather so much that we wanted to be outside as much as possible. I love True Food Kitchen, but we discovered another new place (to us) called CHAR. It is kind of like a Chipotle but with pizza. You go down the line and order what you want on your pizza and then they place it in a brick oven. Delicious!! We drove past it twice. From the outside it didn’t look very cool, but we decided to try it anyway. The atmosphere was really great…outdoor dining with live music on a Friday night. Families everywhere. Again, perfect weather and open indoor/outdoor dining. It was great! We also discovered Nectar. I fell in love with the Acai Superfood Bowl. SO GOOD! We had a great time with the family. The weather couldn’t have been better. We discovered some new things that we will have to do again. They were simple but we created great memories. 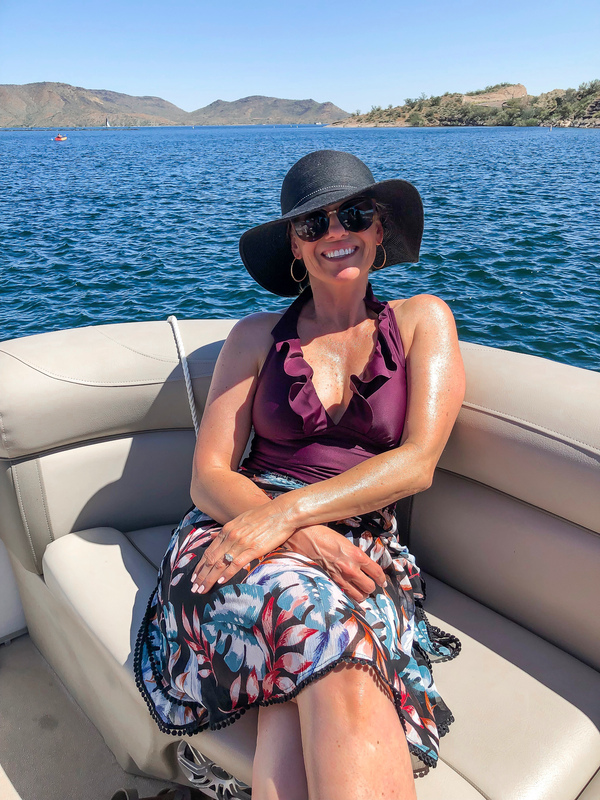 If you are heading to Arizona (or are having a staycation in AZ) and want to do something different, rent a boat for the day and cruise around Lake Pleasant. It wasn’t that expensive and created amazing memories for our family. They do all the work for you. They get it set up, you get on and they show you how to work the boat, and you bring it back in at the end of the day! So easy! I am glad to be back, but miss the sun. If you have some favorite things to do in Arizona please comment below and let us all know. I would love for everyone to have options and help for planning an amazing vacation to one of my favorite states. I hope you have a great week ahead! Next Post How to Get Beautiful Prints Your Home for FREE!